Line 1 ‑ Start with the tax liability reported on your income tax return. are subject to an addition to tax charge. year. See the instructions for Line 5 for more information. installment period are: May 1, June 15, September 15, and January 15.
filed even if you are due a refund when you file your tax return. may be assessed an addition to tax. the year (see the instructions for Line 5). if you were not required to file an income tax return. installment and enclose a schedule showing your computation. owe an addition to tax. paid the entire tax due by March 1, 2018. 2017 as the date of payment. Column C, then to Column D. See Line 13 instructions for an example. 23218‑1115 or (804) 367‑8031. Tenemos servicios disponible en Español. with the installment due date. clarification in order to be completed properly. not owe the addition to tax. Enclose Form 760C with your return. 5. 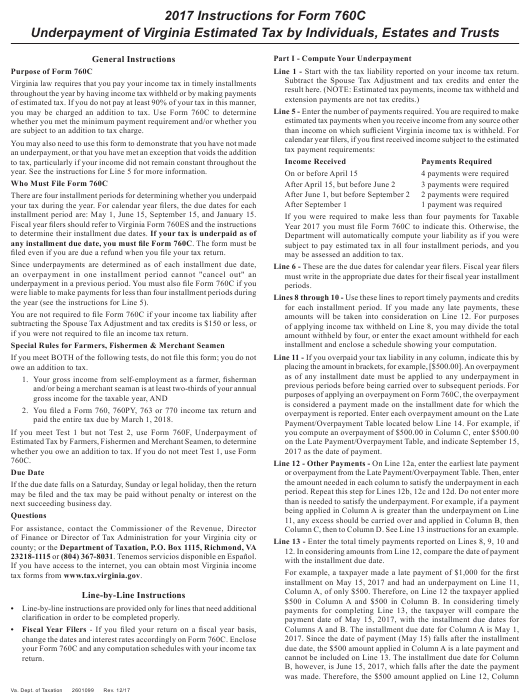 Virginia Tax - Enter the tax computed on Line 4. 7. Exception 2 Tax - Subtract Line 6 from Line 5.
meet Exception 1 in a given period, you should try Exception 2, 3 and 4.
period - each period must be considered separately. tax for each installment period computed using annualized income. income if your income had remained constant during the year. have reflected an income tax liability. reported an underpayment, proceed to Exception 4. Line 19; Form 763, Line 19; or Form 770, Line 4.
received for the first four, five and eight months of the taxable year. 3. 2016 Tax Liability: Subtract Line 2 from Line 1.